I LOVE your blog! Of course you can snag any pictures you want from me! I can email you some if you'd like. I absolutely adore your Ashley and Leila. They truly "get it" when it comes to Haiti. 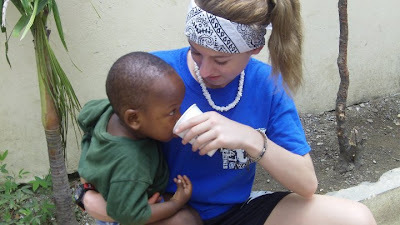 They are the first to say 'yes' for every trip Helping Haitian Angels schedules. They have raised lots of money here in Virginia too! While waiting for our flight last week Ashley told me that she thought that "going to Haiti is a privilege and should be taken seriously". I thought that was awesome coming from a 15 year old girl! I wish you could see the kids faces light up when they see her walk through the gate to the orphanage! Priceless! Thanks Debbie for this insight into my Ashley. I'd love to have pictures anytime. Oh you must be so proud! and with reason! Your grandaughter reminds me of my best friend when we were that age. And now, she and her son go to Guatemala to do something very similar. 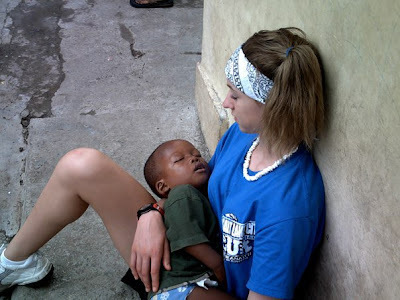 I am weeping openly Mary...what a living testament of Source's Love this young woman is. I can only imagine the pride and wonder you must feel when you see pictures like this, and hear of her work. She truly is an Earth Angel! My...my heart is so touched! May All Children everywhere fall asleep in someone's arms, protected and cared for, loved and sheltered. Peace to the Children. Caring must run like a river through your family Mary. And you must be very proud of your Grandaughters compasion. What a sweet picture of such a sweet and nurturing granddaughter. You must be so proud of her! I SOOOO wanna be your granddaughter when I grow up!! well, Your granddaughter is a lovely soul, I know where the angel learned her flight!